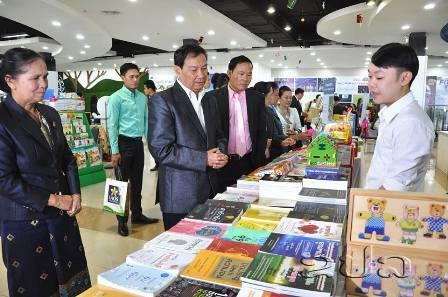 Book Festival 2017 was launched Thursday at ITECC Mall in Vientiane Capital, drawing a wide range of books of novels, poems, short stories written by local and foreign authors. Launched in the presence of Vice Minister of Information, Culture and Tourism Bouangeun Saphouvong, Vice President of Lao Writers’ Association Phewlavanh Loungvanna, the book festival aims to promote book reading, especially among young people. “Since we realize that book festival is important to promoting human resource development, we are organizing this book festival,” said Mrs. Phewlavanh Loungvanna. “Book is written for enriching the knowledge of readers and entertaining them”. The five-day festival also features exchange sessions between writers and poets. There are almost 20 booths representing local and foreign book publishers.